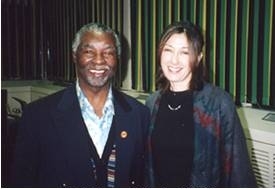 Christine Maggiore with Thabo MbekiThe death from pneumonia of AIDS denialist Christine Maggiore, 52, is eliciting sadness but no surprise from HIV researchers, AIDS activists, and clinicians. The known facts of the Maggiore case follow the tragic arc of HIV disease in untreated HIV-infected women. Christine Maggiore was HIV-positive, rejected medical care, gave birth to two children, one of whom died at three of AIDS, and then died herself, about 16 years post diagnosis, of prolonged pneumonia, which is a common consequence of HIV infection. These events are consistent with mother-to-child transmission and HIV disease progression to where antiretroviral treatments are not available. These untimely deaths were unnecessary: they could almost certainly have been prevented by appropriate medical treatment. The still greater tragedy is that Christine Maggiore spent almost 15 years persuading other people with HIV to follow her example, and many of these have died. We hope that the terrible lesson in the deaths of Eliza Jane and Christine will be heeded by those who are still alive: HIV will almost always lead to AIDS and death in those who are untreated, and refusing to believe that this is so offers no protection from the virus. Ms. Maggiore reportedly first tested positive for HIV, the virus that causes AIDS, in 1992. Unwilling to accept the challenges of her diagnosis and under the influence of Berkeley denialist Peter Duesberg, who has never done research on HIV, Maggiore adopted the scientifically indefensible position that HIV does not cause AIDS, known as AIDS denialism. On this basis she refused anti-retroviral therapy for herself and to prevent transmission to her children, whom she breastfed despite the known risks. When her untested 3-year-old daughter become desperately ill in 2005, Maggiore did not disclose to hospital personnel that HIV was a possible underlying cause, and the little girl died. While information about the underlying causes of the pneumonia that took Maggiore’s life is not yet available, deaths from pneumonia among otherwise healthy women in their early 50s are extremely rare. At this time, it is not known if the family will allow an autopsy to be performed. We urge her family and supporters to have an official autopsy performed and to publish the full facts of her illness and death. * Christine Maggiore’s visibility and influence were based on the details of her personal story, and specifically on her claim that despite her HIV diagnosis she and her family were vibrantly healthy without medications. Maggiore wrote a book and founded an organization, Alive and Well AIDS Alternatives, that promoted AIDS denialism and encouraged the rejection of HIV science and the medical advances in treating the virus that have sharply reduced HIV-related deaths in the United States and elsewhere. She met the former South African president, Thabo Mbeki, and encouraged his denialist policies that have recently been found to have resulted in more than 300,000 preventable deaths in that country. Maggiore’s own life and her healthy family were the evidence she offered for her denialist claims. Now, the two family members known to be HIV positive are dead, and those known to be uninfected (her husband and son) are alive. Her survivors and supporters have a moral obligation to make all the facts public. Anything less can be reasonably assumed to be a cover-up. HIV denialists immediately rejected the role of AIDS in her death, noting that she had lived for 16 years without antiviral treatment since her first positive test. But 16 years isn't outside the normal progression for untreated HIV infection. At 10-15 years post-diagnosis, about 10% of those infected, who do not suffer rapid immune suppression. Most of these still eventually progress to AIDS—about 86% by 18 years after diagnosis. Christine Maggiore’s infection, illness, and death are entirely consistent with HIV/AIDS, and unless a legitimate, official autopsy by a licensed M.D. pathology team can conclusively prove that she was uninfected and that her immune system was healthy, the cause of her death should be considered "AIDS-related pneumonia." The story of Christine Maggiore interweaves several tragedies. Eliza Jane and her mother are both dead. The lives of Christine’s husband and her young son have been devastated. Hundreds, perhaps thousands, of other people with HIV have been persuaded by HIV denialists to reject the best available treatment, and have become ill and died. In South Africa, official denialism killed hundreds of thousands. If anything good were to come from this tragic story, it would be the end of AIDS denialism. Denialist supporters have theorized that she died as a consequence of an alternative detoxification cleanse a month before, or from grief and chronic stress in the aftermath of her daughter's senseless death. Christine Maggiore was one of the last surviving visible, influential HIV-positive denialists. Most prominent denialists are HIV-negative: those who were HIV-infected have either died or abandoned denialism and sought ARV treatment with generally good results.